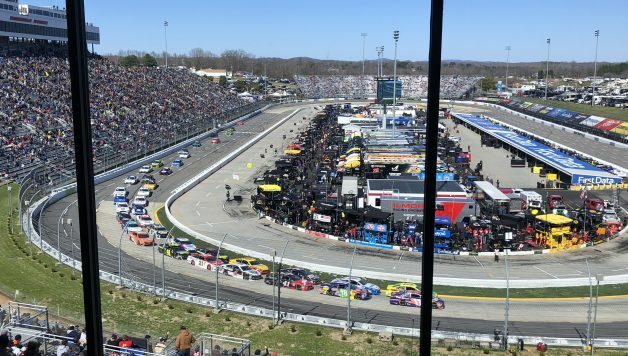 I’d never been to Martinsville Speedway until last weekend, and it was four days I’ll remember for a long time. The day started out smoothly. I made it to the track from my Long Island, New York home in less than 10 hours. When I arrived at 2:30 p.m., there was just enough time for me to watch the Camping World Truck Series have its final practice of the day and explore the short track’s infield. I went to Clarence’s Steak & Seafood House with a friend for dinner and had a tasty fish and shrimp meal. A few NASCAR media members recommended it and I’m glad they did, because I thought it was decent food with a reasonable price. After dinner, I drove to my Airbnb residence only to learn that my host was “no longer with us,” according to the people that were in the house. They had no idea who I was, why I showed up at their front door, or even know what Airbnb is. A full story about the mishap can be read here. Saturday went well, except for when the wet stuff came. 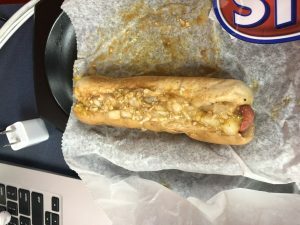 I’ve heard that the famous Martinsville Speedway Hot Dog is the best $2 delicacy one can buy in Virginia, so I had to try one for myself. I was a little unsettled by how red the meat looked, but I ate the dog with chili, mustard, slaw and onions on it. It was a decent, well-topped food, but I wasn’t exactly awestruck by it. It tasted like an average dog that I could easily make at home. But I suppose it was pretty good for the price. There’s no other professional sports venue that I know of where one can purchase a $2 hot dog. The truck race started on time, but only 23 of 250 laps were completed before it began to flurry. It was eventually postponed, and people started to leave. However, it was quite a challenge for some folks who were parked in the unpaved lots around the track. One of my friends couldn’t maneuver his car from the muddy and snowy media lot, so two other friends of mine had to return to the track after they had just driven to their hotel 50 minutes away in Greensboro, North Carolina to retrieve him. Inconvenient? Yes, but I’m sure we’d all do the same for each other if any of us were in that situation. I woke up at 8 a.m., looked at Twitter, and saw that about five inches of snow forced NASCAR to postpone all on-track activities for the day. Some NASCAR folks managed to make the most of it though. A dozen people (myself included) met up with Jeff Gluck for lunch at Hops Burger Bar in Greensboro. It was an enjoyable afternoon of racing conversations, storytelling, and quality food with the JeffGluck.com writer. Kudos to him for being a man of the people. He loves the fans, and the fans love him. After snow canceled a NASCAR Cup race for the first time in 25 years, it was finally raceday. The trucks had to finish their race, which resumed at 11 a.m., and John Hunter Nemechek captured the victory. Kyle Benjamin, in his series debut, finished second for David Gilliland Racing. 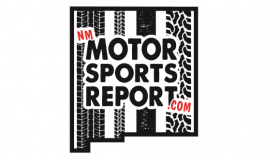 The Cup race was relatively calm with only one on-track incident to bring out a caution, but it was a feel-good storyline as Clint Bowyer ended his 190-race winless streak. As soon as he climbed out of his car for the victory celebration, the beer consumption was underway. Since Gluck was unable to stay in Martinsville for the Monday events, I took the liberty of posting a “Quiet Track” photo. In case you don’t know, Gluck photographs the track on the evening following each Cup race. It’s become a tradition for him to post these photos on social media. For @jeff_gluck, who couldn’t be here today. Although the weekend didn’t go as planned, it was nonetheless memorable. 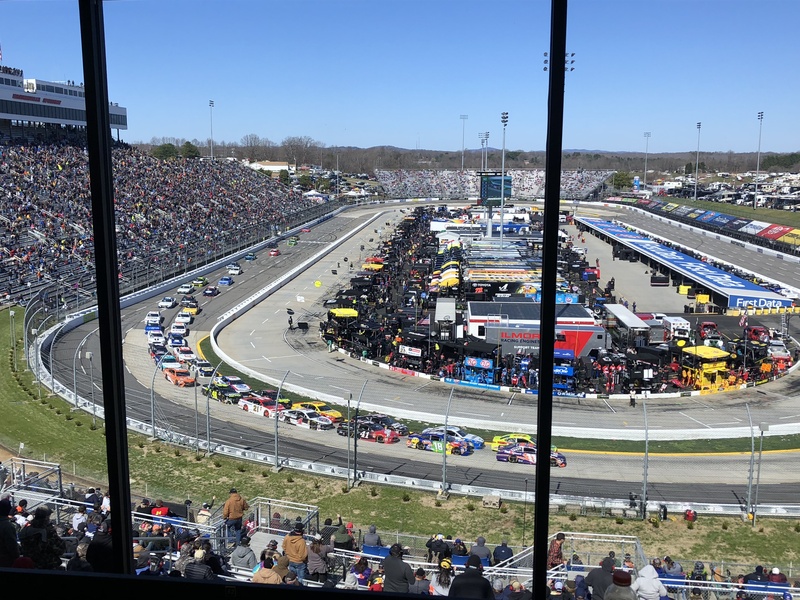 Despite last-minute lodging changes, immobile cars in sloppy parking lots, and Monday races, it was a magnificent time down in Southern Virginia.